Knowing when to travel to Cancun is important, depending on who you come with and what you want to do. In Mexico, as well as in the United States, vacations are aligned to school calendars, which means that any date apart from summer and winter vacations, is perfect to enjoy the following activities in Cancun. Visiting the archaeological spots of the Mexican Caribbean in low season means being able to enjoy them almost at your own pace, without so much influx of people and more flexible schedules, avoiding many rows. How about a tour to Chichen Itza, the Riviera Maya and Coba to culminate in incredible Tulum? Despite being rainy season, the climate is mainly mild during the day and there is less humidity. This will allow you to enjoy more outdoor activities, like swimming with dolphins. Although it is cloudy, it is not cold. The rain rarely keeps things stop from happening in Cancun. Also, in case the rain does keep you from doing other activities in Cancun, there are other options to carry out indoors, such as partying at the hotel bar. Due to lower demand, the low season triggers bids on airline tickets, hotel and even shopping centers, as it coincides with discount season at stores. If your thing is to go shopping anywhere you go, the low season in Cancun is ideal for you. Book in advance for these dates and save money so you can invest in another tour, in a great restaurant or nightclub in Boulevard Kukulcán or in a visit to the best theme parks. Let's be honest. The dream of many people when they arrive at the beach, after months of being stuck in an office, is to swim peacefully and rest on the lounge chairs and on the sand. However, this dream is diminished with the bustle of the high season and the only thing you have left is to spend your energy keeping up with the party instead of disconnecting and resting. If you go in low season, you will rest properly, without having to worry about booking a place on the beach, and you will return to your regular life with recharged batteries. With all the offer of activities in Cancun that can be done with your partner, it is not surprising that this place of Caribbean breeze, white sand and turquoise waters are preferred to start or fan a romance. Cancun, in general, is ideal for couples looking to change the atmosphere and get out of the routine. However, in low season you may find a deeper emotional connection when surrounded by peace. You can take advantage of Isla Mujeres and its colorful buildings, swim with dolphins in the tranquility of the sea or strengthen your link with nature in the Isla Contoy reserve. No matter what you do, remember to book your visit in advance to save money and inconveniences. The low season does not guarantee that there are no lines to carry out any activity, but you can definitely make the most of your time. 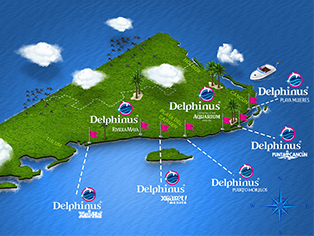 At Delphinus, we want your next holidays in the low season to be memorable. Book a swim with dolphins and enjoy our habitats to have a more personalized experience.